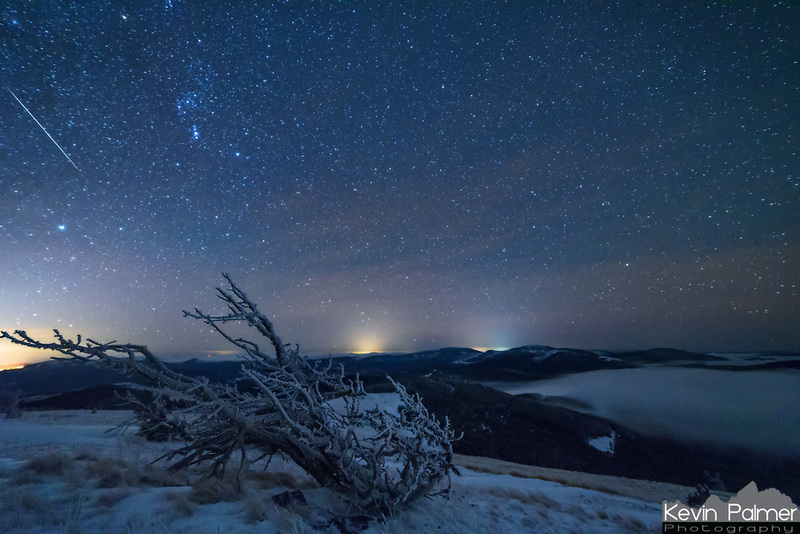 For the Geminid meteor shower I snowshoed to the top of the continental divide in Western Montana. From the Granite Butte lookout tower, the views were stunning in every direction. The weather changed by the second alternating between snow showers, gale force winds, freezing fog with zero visibility, clear skies, and brief moments of calm. The tough whitebark pine trees which grow up here are all permanently bent. They point eastward from the prevailing westerly winds which almost never stop. The low temperatures, strong winds, and fog combined to create hard rime ice, which covered every surface (including me and my camera) with a coating up to 2 inches thick. To say that shooting conditions were challenging would be an understatement. My tripod had to be carefully propped up to avoid it blowing over. And with all my batteries dying too soon, I didn't get to take as many pictures as I wanted to. But this was one of the brighter meteors captured, flying in between Orion and Sirius.